When I worked as a South Haven bureau reporter for the former News-Palladium newspaper at Benton Harbor, Michigan, I met an elderly man living in the Douglas/Saugatuck area who had a strange story to tell. 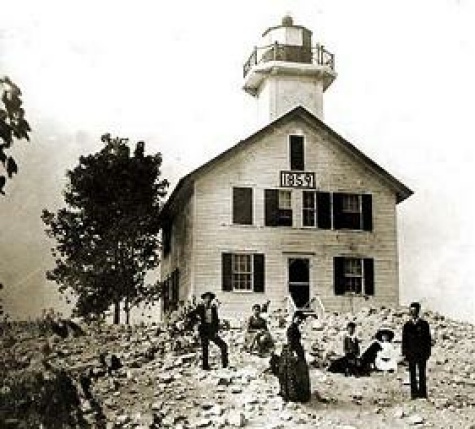 He said that in his youth he remembered a third lumber town that existed along the Lake Michigan shoreline, not far from the location of Douglas and Saugatuck, that still exists, but has been buried by shifting sand dunes. The story of Singapore has been well documented now, and is part of the local heritage. But at the time I met this old native and heard his story, the memory and almost all trace of the town was not only buried, but nearly forgotten. Founded in 1836 by Oshea Wilder, a New York businessman, Singapore was considered the more prominent of the local lumber camps in its day. The lumber barons set up their operations in the area because of the great pine forests that existed there. In its hey-day, Singapore boasted at least three mills, two saw mills, a general store, a schoolhouse, a large boarding house, several houses, a bank and a cemetery. Some say at least 23 buildings may still be standing under the great dunes of sand. The community became large enough that it became a platted village. There were boardwalks that connected the stores. Located along the Kalamazoo River and near the shore of Lake Michigan, Singapore also became a small lake port community with a dock extended out into Lake Michigan where ships moored to load lumber, much of it bound for Chicago. There was even a lighthouse erected on the coast. But Singapore became what some historians call “Michigan’s Pompeii” after it was buried under the dunes of sand. How could that have happened? The destruction of the town is the thing that has made the very name of Singapore, Michigan, a unique part of Michigan’s history. The fires of 1871 burned Chicago, Holland and Peshtigo, so the demand for lumber to rebuild these cities was high. The lumber barons stripped the forests in and around Singapore in their rush to cash in on this demand. Without the protective tree cover, the winds and sand blowing up from Lake Michigan began eroding the town. The old man I talked to said the dunes began building up around the houses and buildings, then burying them one-by-one. Nothing could be done to stop the march of the moving dunes. By 1875 Singapore was almost completely deserted. Singapore remains today one of the nation’s more famous ghost towns. If not crushed by the weight of the sand, some of the old buildings may still stand intact, especially if the sand got into the windows and doors and filled the interiors. The entire town remains buried under the dunes. Only remnants, like portions of the old dock, are to be seen today. Even the lighthouse that stood at the coast is gone. It was destroyed by a tornado.